There isn’t exactly a great story here, but the character is interesting and we do get some pretty compelling moments. As a characer study, this movie is fascinating. Tom Hardy is great as usual, continuing his streak of roles that show no fear and are as out there as can be. The movie really takes you inside the head of Michael Peterson, a prisoner who later adapts the name Charlie Bronson. The problem is that there is very little in the ways of story. There is no problem or mission to the film of any kind, and this is simply about an interesting man serving his time in prison. The character study can only take you so far. This movie was definitely on the right track, but fell just a little short of its mark. Tom Hardy is a fantastic actor. He’s the kind of guy that chooses smart and interesting roles and doesn’t really care about anything more than whether or not the movie will be good. That’s why he took a role like Bane, in the Dark Knight Rises, knowing his face would never be seen (much like Hugo Weaving playing V in V for Vendetta.) Hardy has no problem taking on incredibly challenging roles that put him in difficult situations. That was the case with Mad Max: Fury Road, about a year ago. While doing big budget films like that, he also finds the time to do smaller art house movies like The Drop, with James Gandolfini. And perhaps Hardy’s best role of all was in his smallest film, Locke, a movie that took place entirely in a car during a single drive. It takes guts to sign on for a movie like that, and Hardy has got them in spades. 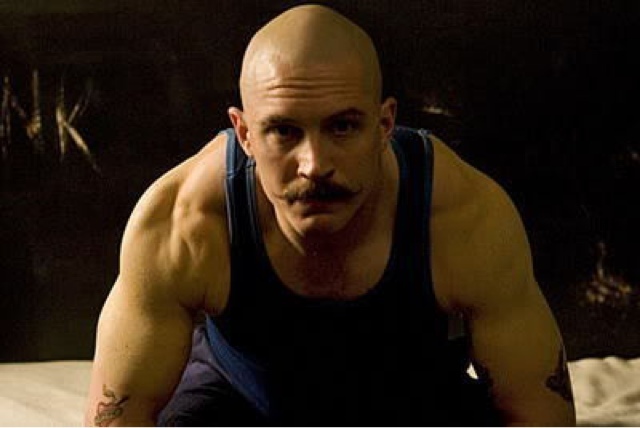 With the movie Bronson, Hardy again shows that he is willing to meet any challenge if the material is interesting enough. This time he is playing the most violent prisoner in the history of England. Michael Peterson (Hardy,) is a man who is violent for no good reason at all, other than that he likes fighting. He also likes entertaining people, and does a one man performance on stage for his fellow prisoners, whenever he gets the opportunity. With that performance, he tells some of his life story. The movie is about how this man found himself in prison, getting the reputation as the most dangerous prisoner around. It all started when he was young, working in stores and robbing them. Michael had no respect or fear of anyone, including his bosses and also the police. When they showed up at his house one day, to question him, Michael responded by immediately attacking them. The scene happened to be kind of funny, in the sense that Michael didn’t even want to hear them out. They weren’t coming there to arrest him, but to ask him questions, and just the sight of them made him go off and start fighting. It felt like the kind of scene where the police were thinking, “we’re not here for that, we just want to talk.” Only Michael didn’t give them the chance to explain. Back in prison, Michael is brought into cells by guards, and he attacks them all, making it his goal to take out as many of them as possible. He’s a big guy, and likes to strip down naked in order to fight, often putting on war paint, to prepare. Michael considers himself a warrior, and revels in the chance to do battle. In one scene at the prison, he has the librarian bring him up a book, only to hold this man hostage in his cell. He makes the librarian and all of the guards think that he is going to hurt this man, but really, Michael has no intention of that. He’s not one to wail on helpless individuals, and instead, uses it as an opportunity to lure the guards into his cell for a fight. That’s when he strips down and gets the paint on. While he’s waiting for them to arrive. All of this leads to Michael being given massive amounts of pills that make him barely able to move. There’s dance party at the institution where he is being held, and Michael walks around the room like a zombie, not even sure of where to go. He has to be directed back to the middle of the room by the orderlies. The other patients notice his condition, and one of them takes advantage and walks over to threaten Michael. While he can’t do anything at the time, Michael takes all of this in and waits out the drugs. Once they ware off, he goes right up to that inmate who made the threats and strangles him to death. All of this is kind of interesting. Hardy presents a real character in Michael, and by that, I don’t just mean that he’s based on a real person. This is the kind of guy who makes you want to figure out what’s going on inside of his head. Michael doesn’t seem to want to hurt people for any reason other than that he likes a good fight. He doesn’t have any real anger towards anyone unless he is provoked. And he apparently doesn’t mind the taste of blood or getting beat by the guards, which is the inevitable result of all of these fights. There have been many movies about prisoners and their time spent behind bars. It’s a side of society that most people never get to see, and so they make movies about it to show the public and area that they are unfamiliar with. The problem is that more often than not, we don’t get much of a story. The Shawshank Redemption was one of the rare prison movies that actually had a story. 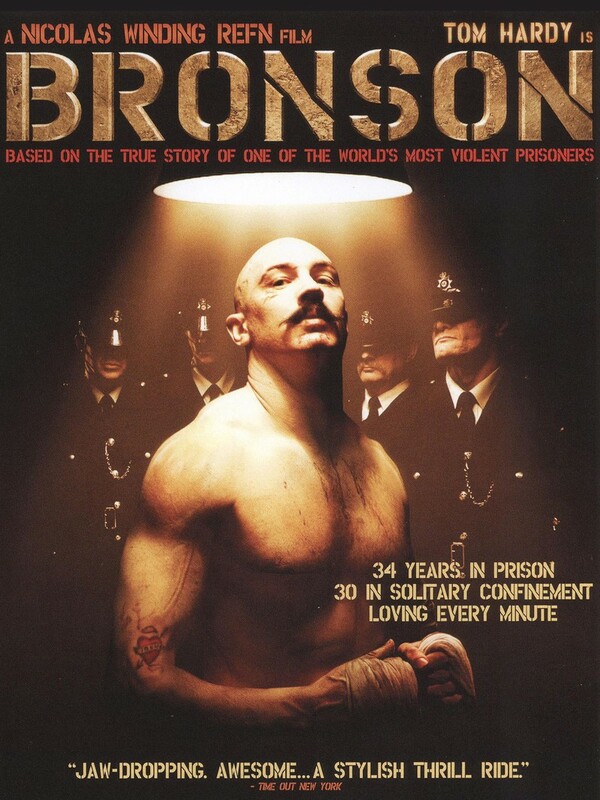 Bronson, unfortunately, is more like Chopper, the Eric Bana movie, about another famous and violent prisoner. It is entertaining from a character perspective, but certainl not from a story perspective. There’s no real beginning or ending, problem or solution. Instead, this movie often feels more like a documentary. Especially with Michael giving voice over directly to the camera. At one point, after being sedated for a while, and seemingly learning to accept his fate, Michael starts doing artwork. He has a teacher in the prison who encourages him, and even tries to show Michael’s paintings to the warden, making the case that Michael is better, and should be released soon. The warden has no interest. He doesn’t even look at the paintings that Michael has made, and really only cares about one thing. Whether or not Michael will become violent again. And that’s exactly what he does. When the art teacher starts getting a little too friendly with Michael, talking about his case and how Michael really should be getting out soon, it sets Michael off. He doesn’t necessarily want to get out, and this man who thinks everything is great and calm actually pisses Michael off by not showing any signs of being afraid of him. Instead, the man sticks his nose into things that nobody asked him to do, such as Michael’s release. This all leads to Michael freaking out on him and holding him hostage, much like he did to the librarian, earlier in the film. And Michael turns this man into a living art project. Bronson is a fine movie that is definitely entertaining, but unfortunately doesn’t have much of a story. The character is great, and some of the situations he puts himself in make for some fascinating scenes. But there is no over-arching storyline, other than that this man loves violence so much that he can’t help himself from doing things that will bring him a fight, even thought he knows that he will be the one taking the biggest beating. For Hardy, this movie is another success story. It’s too bad the story itself wasn’t better, because the character was absoltely terrific.